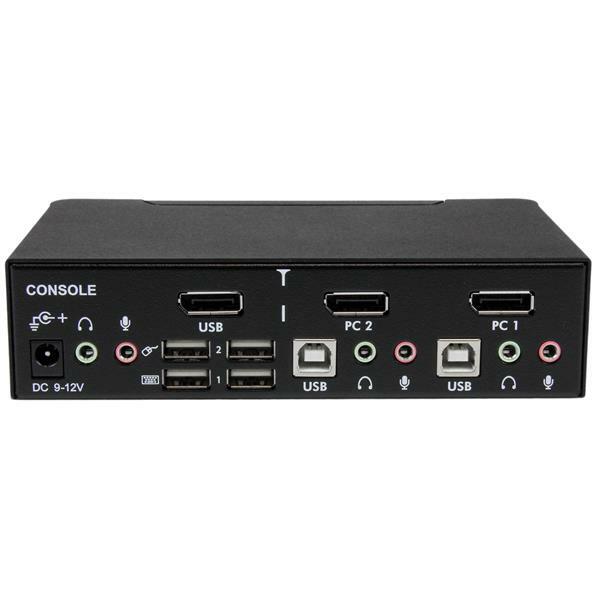 The SV231DPUA 2-Port USB DisplayPort KVM Switch delivers dual computer KVM control, for demanding high definition multimedia applications. Supporting DisplayPort connections with a native resolution of 2560 x 1600, and support for both 7.1 HD digital audio (when connected to supporting displays and sources) and 3.5mm stereo analog audio/mic. 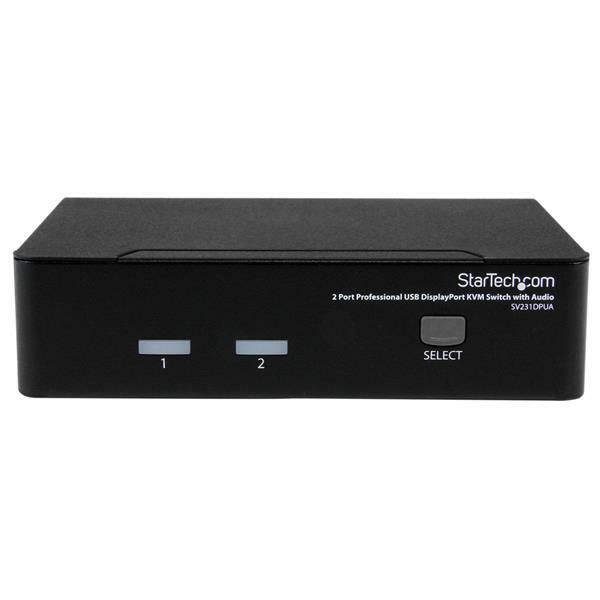 A simple, yet comprehensive KVM solution, the 2-port switch features both front-panel push-buttons and hotkey switching, and offers a small form factor design with connection ports situated on the rear panel. A Plug-and-Play USB 2.0 hub port allows you to share an additional USB peripheral between the 2 connected computers, avoiding the expense of purchasing duplicate peripheral devices. A suitable solution for medical applications (MRI, X-ray diagnostics etc. ), the KVM switch supports a maximum resolution of 3840 x 2400 at a reduced refresh rate. How do I convert the DisplayPort output port on this device to VGA, DVI, or HDMI? This device outputs DisplayPort video signals. If you have a display or video destination that uses another type of video connection, there are ways that you can convert the video signal or connection. These options are outlined below and organized by the target connection. 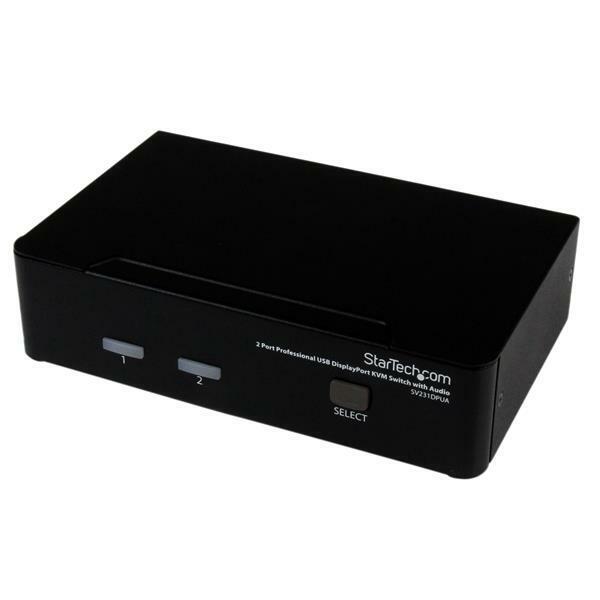 VGA N/A DisplayPort to VGA: https://www.startech.com/AV/Displayport-Converters/DP-VGA/. HDMI DisplayPort to HDMI: https://www.startech.com/AV/Displayport-Converters/DP-HDMI/?filter_CONVERTTYPE=Passive. DisplayPort to HDMI: https://www.startech.com/AV/Displayport-Converters/DP-HDMI/?filter_CONVERTTYPE=Active. How do I convert from my video source's VGA, DVI, or DisplayPort output port to this device's DisplayPort input port? This device has a DisplayPort input port. If you have a video source that uses another video connection, there are options available to convert the video signal or connection. These options will be outlined below for each video source connection. 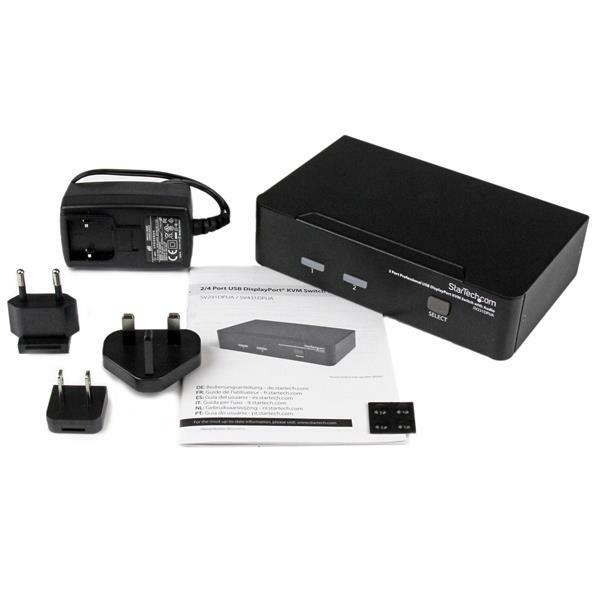 Note: You might need to use more than one converter as part of your solution; however, you should try to use the least number of converters and cables to connect your source and destination. If you have the option to convert from multiple source video connections, choose the option that requires the fewest number of conversions. Works fine with Bizlink/Dell active Displayport -> dual-link DVI adapter. No perceptible extra noise on the audio channels, 60hz at 1440p no problems, switching is nice and responsive. Hotkeys work regardless of which USB port the keyboard is plugged into (even via additional USB hub).